Use Yocto on BeagleBone Black. Want to use Yocto on Beaglebone Black. No problem! You will need at least 50 gb of free disk space that is running Ubuntu 14.04 or greater. BUILD HOST is based on the OpenEmbedded Project. This project uses bitbake to construct images. The OpenEmbedded build system is able to run on Ubuntu that has the following versions for Git, tar, and Python. Python 2.7.3 or greater excluding Python 3.x, which is not supported. Again, if you use Ubuntu, you can use sudo. Debian does not come with sudo, so just apt-get as you normally do - as superuser su whatever. Clone the official Beagleboard repo. Before cloning, create a sub directory and change to that directory. The build directory can be either manually created or created using the oe-init-build-env script. 1. Manually - Configure these paths to the meta layers per your standards. When using oe-init-build-env to create the build directory, some configuration files are generated in the build/conf directory. Editing these are not necessary but optional. Run the oe-init-build-env environment setup script to use bitbake. This defines the OpenEmbedded build environment for the build host and will not overwrite the customized conf files. Note: Use bitbake in the build directory. Change directory to the build directory to use bitbake. Note: Depending on your workstation specifications and internet connect, this could take awhile. If you have build errors due to package download failure, clean the failed package and rerun the build. The cleansstate command works for image recipes also. The core or long build can take some time, depending on your internet speed and hardware. There is a difference when copying a long build or a minimal build to the SD card, as well. Partition the SD card with at least 2 partitions using gparted, fdisk, or another tool. Insert the SD card into the workstation. Use lsblk or df -h to find the microSD card. Warning: This will format any disk on your workstation. Select the specified SD card listed when using lsblk or df -h. In some cases, the SD card may be mmcblk0 or sdb. Double check to make sure the correct device is being formatted. Set the “boot” flag for the first partition. After partitioning is completed, we are ready to copy the files to the SD-card. Copy the boot loaders. The media or SD may be something like /media/bbb/BOOT/MLO. Check your system for the location to copy to the SD. This archive contains the root file system. After completing the copying process, unmount the SD partitions. Then, insert the micro SD card into the Beaglebone. and continue to the section below on how to boot the Beaglebone. Connect the microHDMI cable to the Beaglebone Black. Connect the HDMI end to an HDMI output device such as a television or monitor. 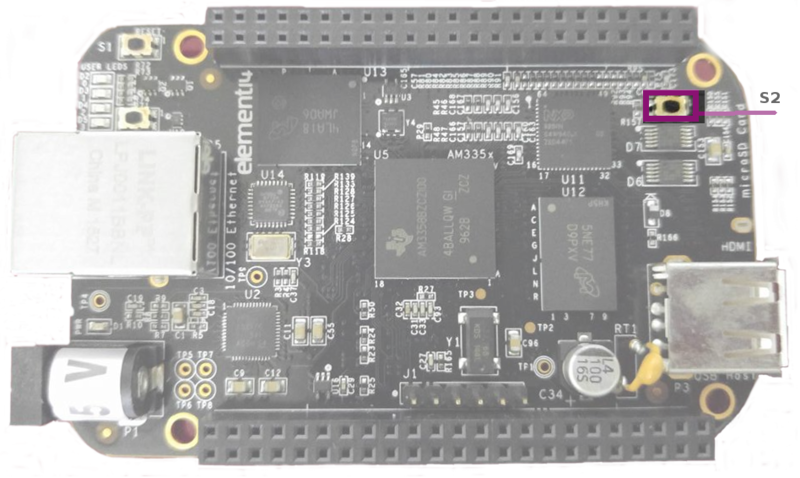 The Beaglebone Black has Debian preloaded. You can flash the image to the onboard eMMC so the SD will boot or boot holding down the S2 switch. There are 4 different ways of booting up: eMMC boot, SD boot, Serial boot, and USB boot. For SD boot, hold the S2 switch on the Beaglebone Black for at least 5 seconds. The lights on the Beaglebone will indicate the BBB is booting. To login, use the keypad and type the username at the prompt. The Yocto default username is root. By default, there is no password. After entering root as the username, select the enter key to login. By using Yocto, you can create customized images using recipes. Once your customization is complete, your images can be used across multiple platforms using Yocto. Yocto Project™ is a registered trademark of the Linux Foundation. use a script or gparted - whatever you usually use. Be careful to only partition the SD card. Use dh -f or lsblk to see which device! Be careful not to hose your OS!